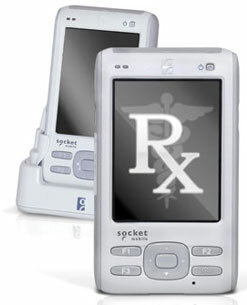 The Socket SoMo 655Rx is a hospital-grade handheld computer made with antimicrobial materials that provide an extra layer of protection against the multiplication and spread of potentially harmful bacteria and microbes. Featuring a durable, lightweight, ergonomic design and robust wireless network capability, the SoMo 655Rx brings reliable automated patient data management directly to the point of care, enabling clinicians to automate health care applications while also optimizing patient safety across different health care environments. Antimicrobial, Windows Mobile 65, 4GB, Multi Languages, Microsoft Office Mobile Includes Battery, Battery Cover, Sync Cable, And AC Adapter Color: White. Interface Cables And Charging Cradle Sold Separately. Antimicrobial Color: White Windows Mobile 6.5, 4GB, Multi Languages (No Microsoft Office Mobile, Battery, Battery Cover, Sync Cable, AC Adapter), 50 Bulk.